Food Processor Attachment is rated 4.1 out of 5 by 10. Rated 3 out of 5 by Soph from A little disappointed For the price you pay I expected a lot more power from it. The vegetables kept getting jammed and I had to keep stopping the processor and restarting it. The shredder didn’t shred as good as I was hoping it would. Rated 4 out of 5 by Ali14 from Very convenient I use this attachment when I need a lot of items prepared at once. It saves me so much time. I slice or dice large batches of onions for bbqs or home made relishes. It’s great for potatoes too. Hard foods work the best. Capsicums don’t fare well in this processor though in my experience and I would really love it if the chute was bigger. I had a problem with the pusher, it developed a crack but KitchenAid had a replacement sent out which arrived within days of contacting them. I really do love this attachment. 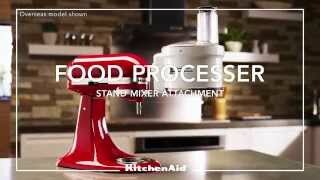 & l adore my beautiful stand mixer which I use daily! Rated 5 out of 5 by Marie from Great results Cut my prep time by about 30 mins, easy cleaning, very good quality. Rated 4 out of 5 by Jane from quick and neat I was given this for Christmas and have used the slicing attachments for coleslaw which has been great for cabbage. I tried the julienne slicer which was good for cucumber but harder to use for carrot. I have not used the dicer yet but it will be useful for making chutneys to save on all the hand cutting. The box for attachments is great with a space for each item. Only down side is the lid of the processor cannot be stored upside down inside the base so it needs more cupboard space. Rated 4 out of 5 by Suze8 from Easy to use I bought this about a month ago. Easy to use, the dicing disc is great. Grating cheese can be a bit of a problem, always have a bit of cheese jammed as with vegies. The slicer works well & it's nice to set it to how thick or thin you want the ingredients. Like the fact that you can process the food straight into your serving bowl. Rated 5 out of 5 by Karyn-Marie from Great for dicing. Brought food processor approximately 2 weeks ago and so far only used dicer attachment. Cuts down a lot of preparation work. I really like how everything fits nicely into it’s own compartment which makes storage and easy accessibility a breeze.